Elegant Shell Covered Glass Jar for your coastal bathroom or kitchen. This unique Starfish and Shell canister is 12 inches tall. Our Seashore Shell Glass Jar and Lid is decorated with an array of sea weed climbing the bottom of this delightful glass jar, topped off with a starfish and shell adorned lid, this coastal shell jar is the perfect way to store all manner of sweet treats and home made goodies. 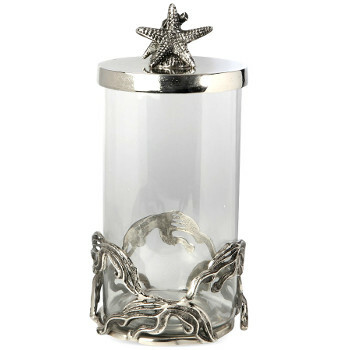 Make this starfish and shell canister a accent piece to your coastal bathroom displaying the essential toiletries . Matching 9 inch canister sold separately.